Yes, after getting a dusting of snow each day over the past week, we awoke to a new 6″ layer of fresh white stuff. Our local weather reported that 180 days prior is when our area received its first snowfall of the season. That’s 6 months of snow and winter…we need to be done already! 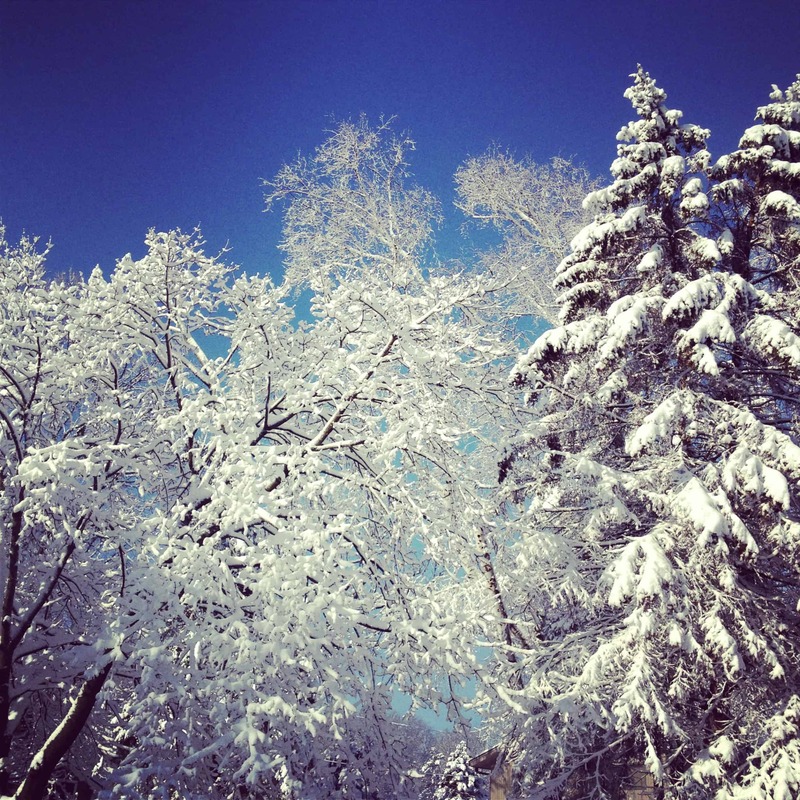 BUT…I did have to readily admit how gorgeous it was out there that morning. The rising sun gave way to a brilliant blue sky, the perfect canvas for strokes of white sparkly powder on dark bare branches and pine. Plus, it was our youngest daughter’s birthday. There was just too much beauty going on to waste with being grumpy about the weather! Back in January, The Pampered Chef sent me a big box of kitchen goodies to play with. This here white skillet has quickly turned into a favorite piece of meal making equipment around here. We use it almost every single day. It’s lightweight, with sloped high side walls that give extra room, perfect for one-skillet meals. The pan heats up quickly and evenly, with a super non-stick cooking surface. We love it! 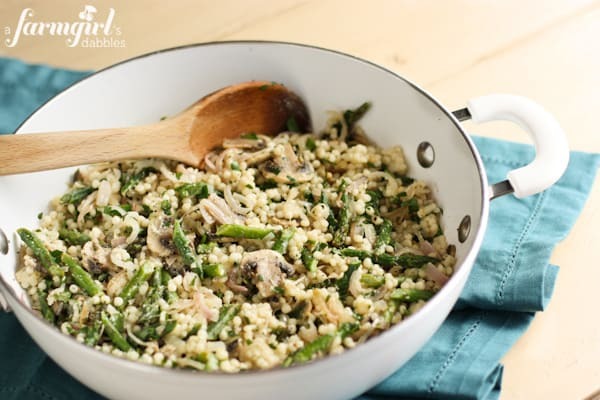 While this Israeli Couscous with Mushrooms, Shallots, and Asparagus is not truly a one-skillet meal (the couscous is cooked in a separate saucepan), this white skillet was just the perfect vessel to bring this meal together. I also set the skillet right on the table and served from it, it’s such a bright and pretty piece! Our kids now cheer when they hear we’re having Israeli couscous, after falling in love with a dish incorporating curried cauliflower. 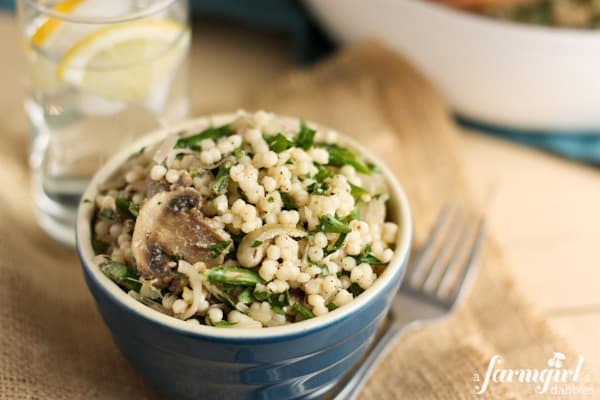 The couscous is just so much fun to eat! A tiny pasta, soft and puffy and delightfully chewy, like little bubbles in your mouth…what’s not to like?! 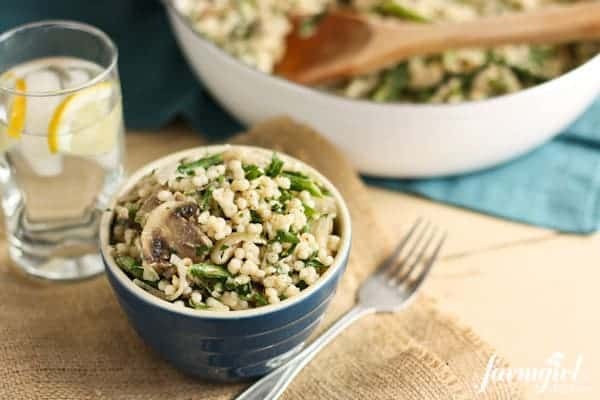 This pasta dish, full of tender couscous, makes for a lovely meal. 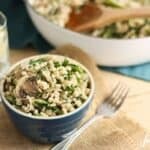 Loaded with tender asparagus, mushrooms, and shallots, and then drizzled with a light lemony dressing, it’s the perfect dish for spring. Whenever that might occur around here! Whisk 2 tablespoons olive oil, lemon juice, lemon zest, 1 clove garlic, and honey in a small bowl. Set aside. Heat 1 tablespoon olive oil in a medium saucepan over medium heat. Add couscous and sauté until you see some of the couscous turning a golden brown. This should take about 5 minutes. Then add the chicken broth, increase heat to high, and bring to a boil. Reduce heat to medium-low, cover, and simmer until broth is absorbed and couscous is puffed and tender, about 10 minutes or so. Remove from heat. While couscous is cooking, start cooking the vegetables. 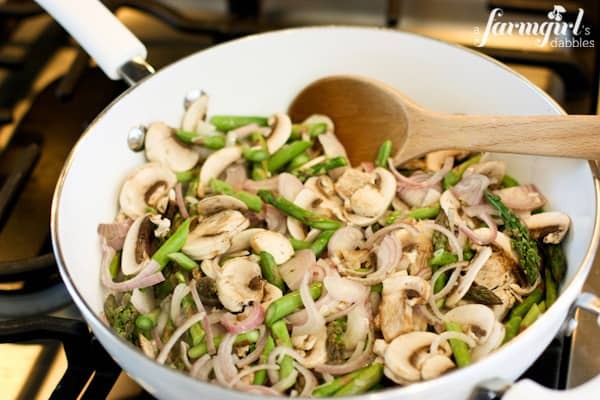 In a large skillet with tall sides, heat remaining 2 tablespoons olive oil over medium-high heat. Add shallots, remaining clove of garlic, and mushrooms, and sauté for 3 minutes, stirring occasionally. Then stir in the asparagus and sauté for an additional 3 to 5 minutes, or until asparagus is crisp-tender. Add peas and cooked couscous to skillet and fold together. Drizzle prepared lemon dressing over the mixture and stir. Finally, sprinkle the Parmesan and parsley over the mixture and fold again. Season with salt and pepper, to taste. Serve warm or at room temperature. Giveaway rules: This giveaway is open to US residents 18 years and older. Giveaway will end on May 3rd at 12:00 am CST. One winner will be chosen at random and then notified by email. Winner will have 48 hours to respond and claim their prize, or another winner will be selected. A farmgirl’s dabbles and The Pampered Chef are not responsible for lost or undelivered emails. Disclosure: I was provided with products, including this 11″ covered skillet, from The Pampered Chef to review. I was not compensated for this post. My family just really loves this pan, and The Pampered Chef was great enough to give one away here. All opinions expressed are my own. To read the full disclosure of this site, please go here.